Hong Sa-ik, an ethnic Korean officer of the Imperial Japanese Army, was hanged in Manila on this date in 1946 for war crimes against captured prisoners in the Philippines. Korea surrendered her diplomatic sovereignty to Japan in 1905 when our man Hong was just 16; five years later, Japan annexed Korea outright. These were events that would move many years of violent hostility on the peninsula and shape the progress of Hong’s life and death. However many and well-remembered are martyrs in resistance, there are always many who would sooner go along with events. Hong was in this agreeable latter camp; when Japan shuttered the Korean military academy he was attending, he simply transferred to the Japanese one. When Japan took over his homeland, he declined his Korean classmates’ entreaties to put his combat training at the service of an underground resistance. Instead, Hong rose through Japan’s ranks to the position (late in World War II) of lieutenant general and supervisor of all the POW camps in the Philippines — whose conduct rated a sore Allied grievance as the war came to a close. Hong was prosecuted by the United States as a Class B war criminal, and was the highest-ranking Korean officer to be executed for war crimes in the postwar period. Imperial Japanese Lt. Gen. Masaharu Homma was shot by a firing squad outside Manila on this date in 1946 for the notorious Bataan Death March. 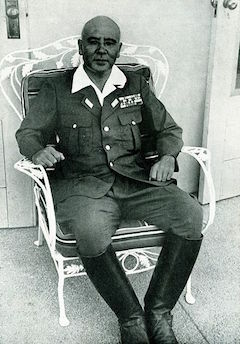 Homma commanded the 14th Area Army tasked with occupying the Philippines immediately after the attack on Pearl Harbor opened a Pacific War against the U.S. Retreating from the Philippines in early 1942, U.S. Gen. Douglas MacArthur famously vowed, “I shall return.” To Homma’s grief, he did just that. While MacArthur cogitated his revenge, Homma was finishing off the remnants of his last great stand in the Battle of Bataan. Bataan was a victory for Japan, but a bloody and protracted one; it cost the lives of some 7,000 Japanese, and the three-month battle has sometimes been credited with slowing the Japanese advance sufficiently to safeguard Australia; it also left the occupiers with an unexpectedly huge complement of POWs. On April 9, 1942, the very day fighting ended at Bataan, transfers began for these prisoners, who would be driven by train and then marched overland some 60+ miles to Camp O’Donnell. More than 60,000 Filipinos and about 15,000 Americans endured this harrowing five- or six-day slog — the Bataan Death March. 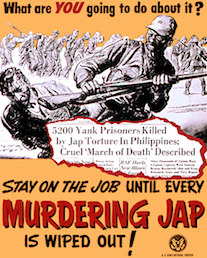 Early reports of the death march made grist for this wartime propaganda poster in the U.S. This crucible of endurance, both physical and spiritual, came by its evil repute honestly; in the age of the Internet, numerous appalling testimonials are within easy reach of a web search. They recount battle-wearied men enervated by hunger and thirst, liable to be summarily shot or bayoneted for making themselves the least bit conspicuous to captors who already disdained them for having the weakness to surrender in the first place. Some were murdered at the outset: having any Japanese “trophies” on one’s person when captured was liable to be worth a summary bullet, or a quick flash of an officer’s katana. An even more certain death sentence was falling behind on the march, and wounded prisoners could expect no quarter: they had to keep up with their compatriots or the Japanese “buzzard squad” trailing a few score meters behind every marching peloton would finish them off with any other stragglers. In different groups POWs might be thrashed or killed over any trifling annoyance; meanwhile, those suffered to live trudged under a wasting sun, nearly unnourished but for fetid handfuls scooped from mud puddles, dying on their feet hour by hour. Dehydrated to the point of madness, some snapped and ran suicidally for the tantalizing nearby village wells that marchers were prohibited from accessing. Something like a quarter, and maybe nearer to a third, of the souls who set out on the Bataan Death March never reached Camp O’Donnell. Those who did entered new portals of torment: rent by dysentery and crowded cheek to sunken jowl, prisoners died off daily by the dozens until they were finally dispatched — often crammed like sardines into the bowels of “hell ships” — to different Japanese work camps. The Bataan Death March was a no-question basket of war crimes, egregiously flouting existing POW treatment accords. * It’s far more questionable whether our man Gen. Homma was the right person to answer for it. 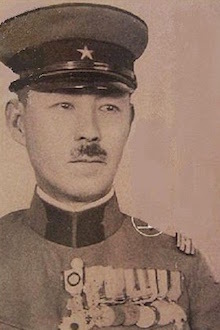 Homma had segued directly from the Battle of Bataan to the succeeding Battle of Corregidor after which he had been cashiered for a homeland desk job. Ironically, it was an excess of leniency that helped earn Homma his enemies among the brass — the opposite of the thing that hanged him. For many who observed the postwar trial slating him with 48 war crimes violations related to the Death March, Homma was a figure more tragic than wicked, prey to returning victor MacArthur’s pique at the defeat Homma had once inflicted upon him. The hanging verdict was controversial then and remains so now. “If the defendant does not deserve his judicial fate, none in jurisdictional history ever did,” MacArthur complained. He honored the mercy application of Homma’s wife Fujiko only insofar as to permit the general a more honorable execution by musketry, instead of hanging. One who would share that sentiment was an 18-year-old Navy man who observed the trial, Bob Perske. Perske would remember this his experiences on the Philippines at the end of World War II “sharpened his sensitivies toward vulnerable persons” and influenced a subsequent career advocating for people with disabilities as well as those caught in the toils of the criminal justice system. Executed Today formerly interviewed Mr. Perske in connection with the wrongful execution of a mentally disabled man in Colorado, Joe Arridy. * It’s worth noting that Japan was not party to the 1929 Geneva Convention on the Treatment of POWs. 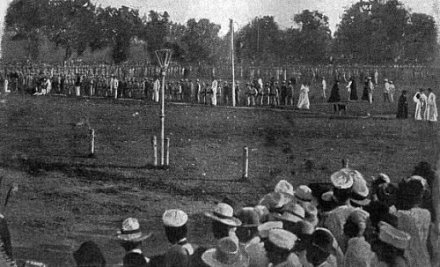 On this date in 1897, eleven pro-independence Filipinos were shot at Manila’s Bagumbayan execution grounds. These eleven,* together with one who was tortured to death on a prison brig and three others who died exiled to prisons elsewhere in the Spanish empire, comprise the Fifteen Bicol (or Bikol) Martyrs. This date’s victims had been rounded up on September 16 at Naga City in the Bicol Region. It was the aftermath of Spain’s discovery of the anti-colonial Katipunan secret society, and mass arrests followed by torture-aided interrogation were the order of the day. These would not, in the end, avail. 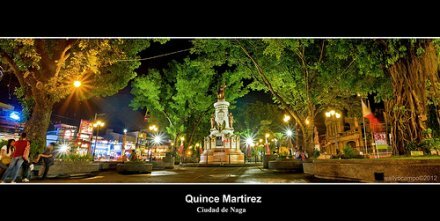 As a result, the “Quince Martires” are still commemorated in independent Philippines every January 4, which is a public holiday in Naga City … and commemorated throughout the year at that city’s Plaza Quince Martires, and its monument. (c) image courtesy of Wally Ocampo. * Rev. Fr. Gabriel Prieto; Gabriel’s brother, Thomas Prieto; Rev. P. Severino Diaz; Rev. P. Inocencio Herrera; Manuel P. Abella; Manuel’s son, Domingo I. Abella; Camilo Jacob; Florencio Lerma; Macario Valentin; Cornelio Mercado; and Mariano Melgarejo. 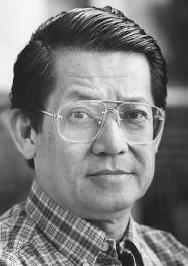 On this date in 1977, former Philippines Senator Benigno Simeon “Ninoy” Aquino, Jr. was sentenced to death by firing squad under the dictatorship of Ferdinand Marcos. Aquino, a lifetime politician from one of the archipelago’s powerbroking families, was one of the principal opposition figures against the increasingly autocratic Marcos. His 1968 denunciation of the “garrison state” — Marcos would quadruple the size of the military and infiltrate it widely into civil society — was one of the definitive and lasting brands upon that regime. So nobody, not least Aquino himself,* was surprised when the outspoken senator was arrested hours after Marcos imposed martial law in September 1972. Unlike most such political prisoners, Aquino stubbornly refused to cut any deal for amnesty that would confer any hint of submission to Marcos. Their conflict reads, on both sides, as an intensely personal one. While Aquino’s death sentence on this date was expected, it was also generally thought that Marcos — who had allowed only one (non-political) execution during five years of martial law to that point — would spare his foe, as indeed he did. Marcos even released Aquino to travel to the U.S. for treatment after suffering two heart attacks in 1980. Aquino had those few years to raise his profile and that of the Philippines opposition around the states. Returning to his native country on August 21, 1983, a moment when a then-ailing Marcos seemed weakened enough for a political opening, Aquino was infamously assassinated right on the tarmac as he stepped off the plane. 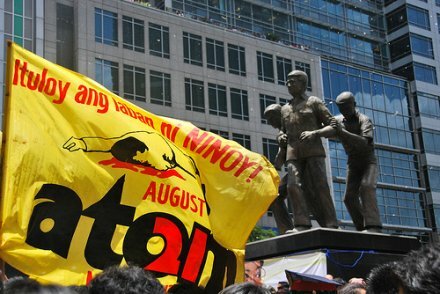 This event, and the two million-strong funeral march of Aquino’s bullet-riddled body to Manila’s Rizal Park, helped galvanize the country’s opposition. By 1986, popular demonstrations sent Marcos fleeing to exile … and elevated to the presidency Ninoy Aquino’s widow, Corazon. Today, the couple adorns the Philippines’ 500-peso banknote, and their only son, Benigno Aquino III, is the country’s president. To pay him a call, just catch the next flight to Manila’s Ninoy Aquino International Airport. [S]trife* [between Manila archbishop Hernando Guerrero and the Spanish governor Don Sebastián Hurtado de Corcuera] being greatly inflamed … became entangled with one of the most memorable disputes that have occurred in the islands — a necessary occasion for the sharpest encounter between the two jurisdictions, and one from which Don Fray Hernando Guerrero could not excuse himself, as it concerned the most sacred part of the ecclesiastical immunity. That was a matter in which the archbishop could not neglect to sally out with all his might, in order to comply with the obligation of a true prelate. The case was as follows: There was an artilleryman in Manila, named Francisco de Nava, who had a female slave with whom he had illicit communication, as came to the ears of the archbishop. The archbishop ordered him to remove from himself this occasion [for sin] by selling the slave-girl to another person; and had the latter placed, for that purpose, in the house of a lady who was related to Doña María de Francia, who became fond of her and arranged to buy her from the artilleryman. The latter was so beside himself over the loss of the said slave that he refused to sell her at any price, saying that he wished, on the contrary, to marry her. But Doña María de Francia so arranged matters that the slave was sold, and came into her possession with very slight effort. The artilleryman, grieved and regretful for what had happened, almost became mad, and, it having been given out that he was mad, certain violence was shown him; and on one occasion he had received a sound beating at the house of Doña María de Francia, because he had gone there to request that they should give him the slave, as he had resolved to make her his wife. Aggrieved and rendered desperate in this way, he saw the girl pass one day in a carriage with Doña María de Francia. Going to her he asked her whether she knew him, who was her master. The slave answered him with some independence, whereupon he, blind with anger, drew his dagger in the middle of the street and killed her by stabbing her, before anyone could prevent it. All the people, both those in the carriage and those in the street, ran tumultuously [after him]; but the artilleryman escaped them all, and took refuge in the church of our convent in Manila. The governor heard of what had happened, and ordered Don Pedro de Corcuera, his nephew (who was then sargento-mayor of the camp), to take the artilleryman from the church, saying that he could not avail himself of the sanctuary of the church, as he had committed a treacherous act — although it was only a homicide, and the settlement of this question did not concern the governor. However, his action arose mainly from the anger that he felt that what had happened was in the presence of his nephew, Don Pedro de Corcuera — who, also being angered at what concerned his wife, made use of his commission with less prudence than he ought to exercise in executing such orders from his superiors. He caused the church and convent to be surrounded; and, going inside, examined everything, not excepting even the sacristy; and it is even said that he declared that, if he found the artilleryman there, he would take him out a prisoner. But not having been able to find him then, Don Pedro left the church and convent surrounded by a double guard. The governor added to that that he would not allow the religious to enter or leave, until he had hold of the refugee. The latter was finally found, and taken from the sacristy, and surrendered to the commander of artillery, in order that he might proceed with the trial as his competent judge; and he, either carried away by flattery, or in obedience to the commands of the governor, proceeded so hastily that in a very short time he condemned the artilleryman to death. The archbishop’s provisor, Don Pedro Monroy,** bore himself on this occasion with the prudence that was fitting, and proceeded against the commander of artillery, requesting him to deliver his prisoner and return him to the church. Having been informed that the commander of artillery was a mere instrument, and that all his actions were according to the impulses of the governor, he sent three lay priests to the palace to intimate to the latter that the judge should deliver the refugee to him. The priests entered, without anyone hindering them; and finding that the governor had already retired, as it was then an advanced hour of the night, they started to withdraw in order to return next morning; but the soldiers of the guard would not permit them to leave, saying that such was the order of the governor. The sentence against the artilleryman having been given — which it is said that the governor sent ready made out to the judge, to sign — they proceeded to execute it,† notwithstanding that the provisor proceeded to threaten censures, and to impose an interdict and suspension from religious functions [cessatio de divinis]. The governor ordered a gallows to be erected in front of the very church of St. Augustine, and the criminal was hanged thereon — to the contempt of the ecclesiastical immunity, for the [proper] place assigned for such punishments was very distant from there. The governor, seeing that the sentence was already executed, and that he had now obtained the chief object of his desire, wrote to the archbishop, requesting him to have the censures removed and the interdict raised, and the churches opened on the day of the nativity of our Lady. The archbishop, recognizing the duplicity of the governor, refused to answer that letter without first consulting the orders; and, after consulting with some of them, decided that he would not raise the interdict, since there was less inconvenience in having it imposed [even] on so festive a day, than there would be in his yielding on an occasion so inimical to the ecclesiastical immunity. However, the requests of the Recollect fathers of our father St. Augustine, who had charge of the advocacy of the nativity, had so much influence that the archbishop ordered the interdict to be removed, and it was done. * “The underlying reason for this public dissension was racial,” says this source. The rivalry reached such an extent that in 1627 the Dominican Order in Mexico refused to admit creoles into its ranks, an act which the Spanish king disapproved. In the Philippines the situation had not openly reached that extreme. The insular hierarchy managed to keep the number of creoles, mestizos and indios who were embracing the religious life down to a minimum. But the racial discrimination rankled among those born in the colonies. 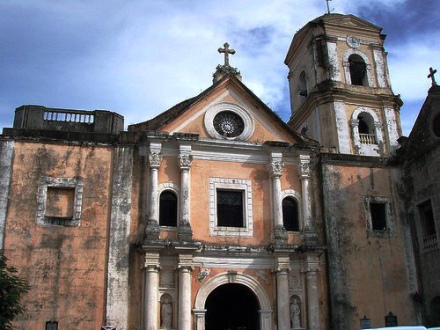 Archbishop Guerrero and Bishop Zamudio were both Augustinians, but the former was a peninsular, while the latter was a creole, and this was probably the reason for their taking opposite sides. ** Later exiled to Formosa. On this date in 1897, days after Philippine independence hero Jose Rizal was shot by the Spanish, 13 martyrs to the same cause suffered the same fate at the same execution grounds. They were casualties of Spanish pressure against the revolutionary Katipunan and/or its Rizal-rounded parent organization La Liga Filipina. Not all this grab-bag of sacrificial patriots were really firebreathing revolutionaries. But the (serious) divisions among Filipino activists and revolutionaries were of small import to the Spanish, who (as the 13-strong martyr batches suggest) went in for the wholesale school of repression. 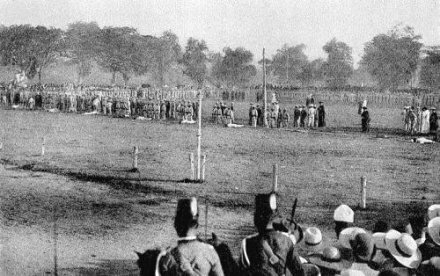 Two photos of the 13 martyrs’ execution, from this page, with plenty of other undated executions.